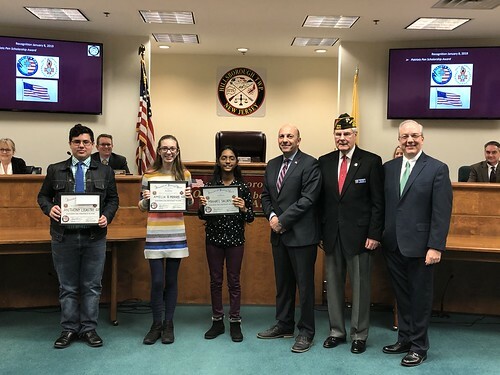 The VFW Patriots Pen Youth Scholarship program challenges junior high and middle school students in grades 6-8 to write a 300-400 word essay on a new patriotic theme each year. This year’s theme was “Why I Honor the American Flag”. Scholarships are awarded to winners, who begin by competing at the local Post level before proceeding to District, Department and finally to the National level where they battle it out for a $5,000 first place scholarship. Amelia R. Morrisa, a 7th grade student, received third place and was granted a $100 scholarship check. Anthony Licastri, an 8th grade student, received second place and was granted a $200 scholarship check. Mahati Salapu, an 8th grade student came in first place and received a $300 scholarship check.